Bethany Cosentino lowers her shades at a few crucial spots on Best Coast’s sparkling sophomore album, The Only Place, and one of them is the languidly waltzing ballad “No One Like You.” With a simplicity, over-the-top sentiment, and sugary melody in the tradition of such girl group classics as Rosie & the Originals’ gently swaying “Angel Baby” (which John Lennon called “one of my all-time favorite songs”), the track leaves Cosentino’s voice and old-fashioned sensibilities vulnerably exposed. “If I sleep on the floor / Would it make you love me more?” she implores, in one of those head-smacking opening couplets that feels like it should have always existed. 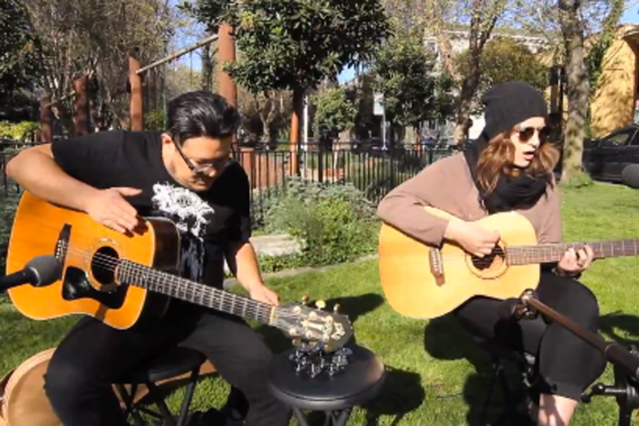 Cosentino and bandmate Bobb Bruno recently laid the song even more bare in an unplugged video for Rhapsody (via Crazy for Best Coast). Cosentino leaves her actual shades on for this one, but her increasingly powerful, alt-country voice rings out all the more clearly, over little more than acoustic guitar strums and Bruno’s splashes of tambourine. Although the language she uses to address her lover here is no more hyperbolic than the ways she describes her native Southern California on other songs, the sunshine falling over the video underscores that this song, at least, is no Hollywood postcard. And just so we don’t start to think Best Coast has gone soft on us, all the clips begin with Cosentino insisting that usually she doesn’t do unplugged sessions. This California girl knows how to have her beach-pop pie and throw it in your face, too.